The Worst Performance Since 1958? In the week that the England women’s football team made further steps towards qualifying for the 2015 World Cup, the men’s team made their fastest ever departure from the World Cup finals. Following defeats by Italy and Uruguay, England crashed out from Brazil after just two matches. Cue the press clamour for historical comparisons: this was, we were quickly told, the worst England World Cup performance since 1958, which was the last time that England failed to get through the group stage. These kind of comparisons are helpful to a degree, as they give us some kind of perspective and put down some historical markers: but just as when the British Olympic medal haul of 2012 was billed as ‘the best since 1908’, it is easy to overlook the contexts of those earlier events. So, what was England’s 1958 World Cup campaign in Sweden all about? Was it as bad as 2014? England topped their three-team qualifying group for the 1958 World Cup with relative ease, beating Denmark 5-2 at Molineux and 4-1 in Copenhagen, and beating Eire 5-1 at Wembley before a 1-1 draw at Dalymount Park. However, between the last qualifier in Dublin in May 1957 and the first match in Sweden in June 1958, the heart was ripped out of the England team on a snowy runway in Munich. Amongst the eight Manchester United players killed on 6 February 1958 were four members of the England team: Roger Byrne, Duncan Edwards, David Pegg, and Tommy Taylor. Pegg had played in the last qualifier, while the other three had played in all of them, with Taylor scoring 8 of England’s 15 goals. The loss was immeasurable, and better pens than mine have explored the ‘what ifs..’ of Duncan Edwards’ potential impact on England’s long-term development. At the time, it meant that England went to Sweden with a partially improvised and inexperienced squad. Only four of the 20 man squad had more than 10 caps before they left for Sweden (including the long-serving Billy Wright with 93 and Tom Finney with 73), twelve of them had been capped seven times or fewer, while three – Tottenham’s Maurice Norman, Chelsea’s Peter Brabrook, and Peter Broadbent of Wolverhampton Wanderers – joined the squad without a cap to their name. However, despite this inauspicious background, and despite the fact that we all know that the team failed to get through the group stage, the England team did far better at Sweden 1958 than their counterparts in Brazil this year. 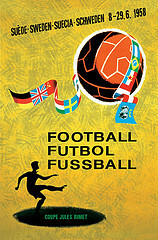 England faced a tough group, involving eventual winners Brazil, Austria, who had finished in third place at the 1954 World Cup in Switzerland, and World Cup newcomers the USSR. The Soviet squad included seven members of the team that had won the Olympic football tournament in Melbourne in 1956, and Sweden was a staging post for the USSR between the victories of the 1956 Olympics and the 1960 European Championship. However, despite this tough opposition, England got through the group games undefeated. They drew 2-2 with the USSR in Gothenburg, 0-0 with Brazil at the same stadium, and then 2-2 against Austria in Boras. One crucial and hugely impressive fact hidden away in that list of draws was that Brazil had appeared in every World Cup since the competition started in 1930, and the 0-0 against England was the first match in which they had failed to score: Burnley’s Colin McDonald evidently played a blinder between the sticks in the face of the Brazilian attack. England finished the group with the same points and the same goal record as the USSR (3 points, scored 4, conceded 4), so a play-off at Gothenburg had to decide who would join Brazil in the quarter finals. The Soviets won 1-0, a 69th minute goal by Anatoli Ilyin sealing England’s fate. So yes: 2014 has been the worst World Cup for England since Sweden 1958, but a closer reading of that tournament shows an England team still reeling from the Munich air disaster getting through their group unbeaten, being the first team to stop Brazil from scoring in a World Cup, and exiting after the odd goal in a play-off. Dates alone can tell only a tiny part of the story. 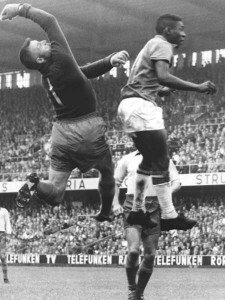 Pele in the 1958 World Cup Final. His first World Cup goal came against Wales in the quarter final. (2-1). Northern Ireland and Wales both fared better, though. Northern Ireland beat Czechoslovakia 1-0, lost 3-1 to Argentina, and held reigning champions West Germany to a 2-2 draw before going through the play-off process with another win – this time 2-1 – over Czechoslovakia. Their 4-0 defeat at the hands of France in the quarter final was far from humiliating. Wales also got through to the last eight after a similar group stage to England with three draws (1-1 v Hungary, 1-1 v Mexico, and 0-0 v hosts Sweden). They then upset all the odds by beating Hungary, runners-up in 1954, 2-1 in the play-off before finally bowing out to a 1-0 defeat by Brazil in the quarter final. The single goal that beat them was scored by a talented 17 year-old known as Pele. It was his first goal at a World Cup finals. 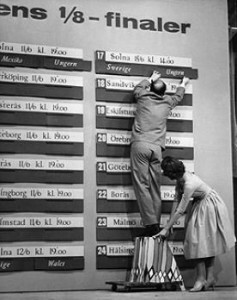 Sweden 1958 thus serves as a yardstick, and is presumably being used to show that it is over 55 years since England did this badly. A closer look at the tournament shows that the group stage exit that happened at Gothenburg was the end of a much better showing than the defeats at Manaus and Sao Paulo in 2014. Moreover, 1958 should be seen as an important point in British international footballing history: it has never been only about England. Role on Canada 2015, with England’s women poised to qualify, and Wales and Scotland looking good for the play-offs.